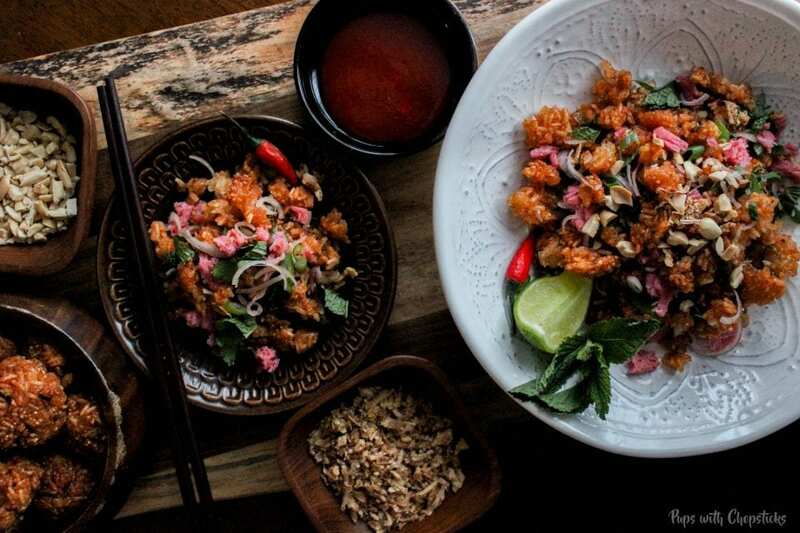 If you have never had a Lao Crispy Rice Salad, it’s unlike anything you’ve ever tasted before and you need to try it because my words just won’t do it any justice. Crunchy, chewy rice with a well balanced tart, salty, spicy and sweet combination of toppings and fresh herbs. It’s honestly something you absolutely must try once in your life. 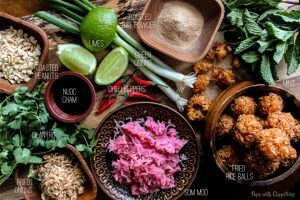 Lao cuisine is quite rare around here and usually a hidden gem in the cuisine world, you might be familiar with it’s flavours if you’ve had Thai or Vietnamese foods. I absolutely love this stuff, so you can imagine how pumped I am to create this recipe for everyone to try. If you have never heard of Nam Khao, it is essentially fried rice balls broken up into bite sized pieces with a medley of fresh herbs, som moo (a fermented meat which I go into detail below), lime juice, fish sauce, hot sauce combined into a well balance of crunchy, chewy salty, sweet and tart salad. It’s nothing I have ever tasted before and a recipe that I will continue to make. 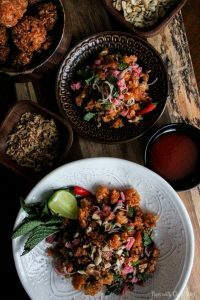 With Nam Khao, the most tedious part of it would be the crispy rice bit, but you can make a lot of it ahead of time and it can sit in the fridge for 3-4 days if properly covered. Once you are ready to make it, just take the ingredients out and throw it together and you will have a very sophisticated salad in a span of 5 mins and I promise you it will be worth every minute. 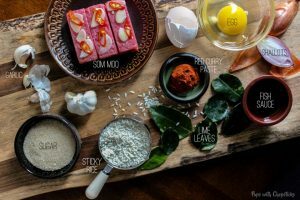 For this Nam Khao recipe, most of these ingredients will be available at the Asian supermarket. Som moo! Some what? Som moo is a fermented sausage that is made with raw pork meat, pig skin and is fermented with curing salts and nitrates. The texture is chewy, think rubber bands. It sounds weird but it’s an very interesting mouth feel once you get used to it and it gives salads another dimension. The flavour is tart, salty, sweet, spicy and garlicky. Heavier on the tang side with a nice balance of sweet and very garlicky. This is also known as Nem Chua in Vietnamese cuisine. If you can’t find som moo, this can be omitted. Although you will lose a bit of the texture and the awesome flavours it adds. 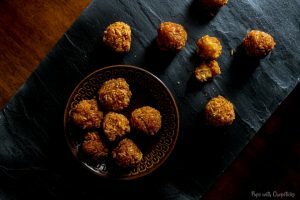 Traditionally, this recipe uses jasmine rice but for this recipe, I use sticky rice because I love the texture of the chewiness combined with the crispiness. You can substitute sticky rice for jasmine or long grain rice. 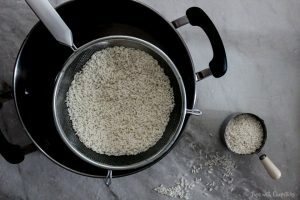 If you are not using the sticky rice, then you don’t need to follow the steps below on steaming the rice and a regular rice cooker or pot will suffice. The rice must be soaked ahead of time for a minimum of 4 hours. The article I tested was ‘The Best Way to Make Thai Sticky Rice (No Fancy Basket Required)‘ by Leela Punyaratabandu. I used the #3 method: with a Colander. FRYING THOSE ADDICTIVE NUGGETS UP! Once you have the rice cooked, combine it with the lime leaves, red curry paste, fish sauce, sugar, garlic, shallots and egg and mix it well. When you are rolling them into balls or ovals, they might come apart, that’s perfectly normal. I found putting a bit of oil on your hands help from it sticking to your palms. If you are using non-sticky rice, I would work on it when it is slightly warm so the rice has an easier time sticking together. If you are using sticky rice, it can be worked on when the rice is cool since the rice gets stickier when it is cooler. Here is the fun part! Toppings! The sky is the limit here. I have provided a few traditional toppings that I like to use but you can experiment and add what you think would taste amazing in it! The star of this salad is the crispy rice, so you really can’t go wrong with flavour pairings! For the dressing, I used Nuoc Cham, which is a simple and flavourful dressing made with fish sauce, sugar, vinegar/lime juice, garlic and chillis. You can also use a watered down soy, lime juice with a bit of maple syrup as an alternative dressing as well. Tip #1 : Serve this as a lettuce wrap to switch up your style of salad! A different and more fun way to eat this. Follow us on Instagram and let us know if you make this recipe! We want to see too by using #pupswithchopsticks! In a pot, bring water to a boil and pour the rice into a colander and set on top of the pot. Put the lid on and steam for 15 mins. Remove rice from the pot, put it into a bowl and cover with a towel for 15-30 minutes until warm and sticky. Add in the curry paste, lime leaves, garlic, shallot, sugar, fish sauce and egg and mix well. Set deep fryer to 350F (176C), or medium heat on a pot of oil on the stove. Deep fry them for 3 minutes or until golden brown. Combine the sugar and the hot water first to melt it evenly into the water. Rice Balls can keep in the fridge in a well sealed container for 3-4 days. Use the rice balls cold to create the salad. I recently became obsessed with this rice after eating it at a Laotian restaurant. I really didn’t want to go through all the trouble of properly making it with the exact ingredients. So, I grabbed some leftover Chinese fried rice, threw in red curry paste, green onion, sugar, salt, garlic, red pepper flakes and fresh squeezed lime juice and fried it loose so the bottom got crispy. Took it off the heat and added salt and crushed peanuts and a little more lime juice. Used green leaf lettuce to make wraps. Allllmost as delicious as my favorite Laotian restaurant. I’m a vegetarian so the pork thing already wasn’t needed. This was a great and easy way to satisfy my craving even if it’s not very authentic or proper. I guess the secret is in that red curry paste. Aii! You are SO awesome Meenah!! 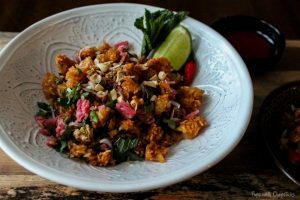 🙂 I also love this stuff and it’s so great to hear that using fried rice makes for a quick way to satisfy this craving – because I swear I can’t get enough of this stuff! I am definitely going to be doing this now! You rock. I’m a bit late for this post, but I can relate to back to bed day! I wish though! My kids never let me sleep past 6:30 am! sigh! 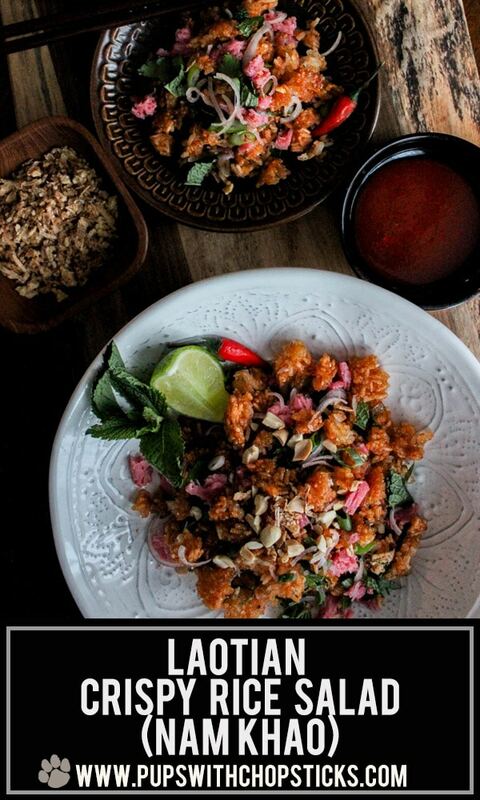 But on the high note….I love Laotian crispy rice salad. It is divine!!! Definitely my favourite food. 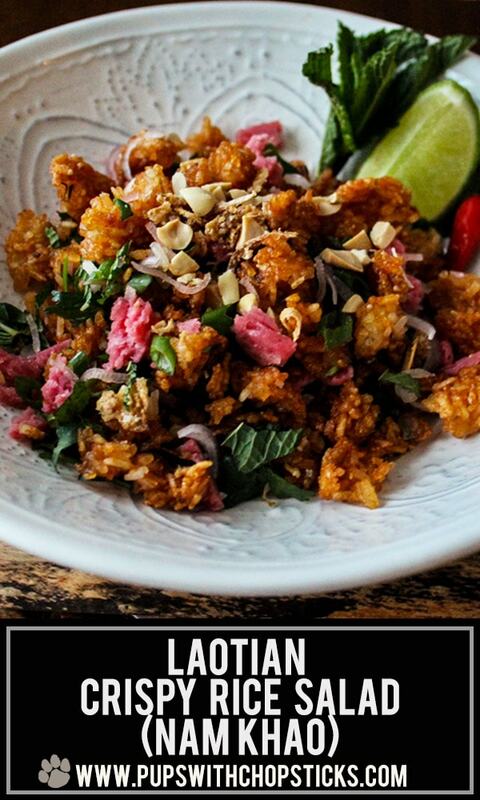 Laotian food is so underrated, I wished more people would try it! 🙂 It’s amazing. This dish is beautiful on it’s own but the way you describe the flavors makes me want to go shopping for the ingredients right now! 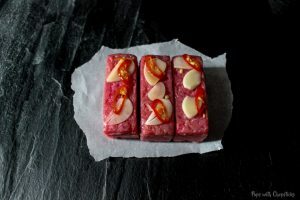 Wonderful photos and excellent tips, thanks for another awesome recipe! Omg I’ve actually had something similar at a restaurant in the past. Now I can make it at home! Yasss! Thanks for sharing, Joyce! Joyce, I am seriously loving you more and more with every recipe you share. 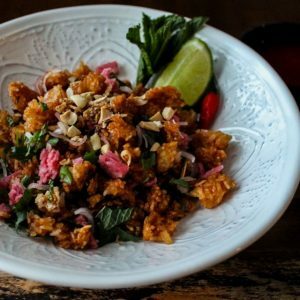 I absolutely LOVE Nam Khao, but I have zero idea how to make it at home. Kind of like I didn’t know how to make lotus root chips or crab spring rolls either– two other foods I eat a lot, but have never made. You are a genius! Keep the amazing recipes coming and my monthly “eat out” bill will be cut in half! Ahahahaha. I am so sorry to laugh, but I loved this story!!! The first time I ever set something on fire in my kitchen I shrieked like a banshee!! 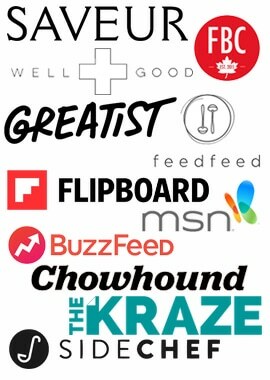 But I feel like it’s a badge of honor, right? You’re not a true cook until you’ve set something on fire?? And those last two pictures, girl…. A+++. This crispy rice salad looks amazing and sounds like it would even pack well for lunches on-the-go! Oh I’m still laughing haha! I’m pretty sure I was shrieking like a banshee as well and trying to blow out the fire and making it bigger haha because DUH oxygen fuels fire? It looks amazing, Joyce! It sounds like you had a rough-go in the kitchen, but you prevailed and made this great recipe:) Everything looks and sounds so delicious! Thank you for introducing me to Nam Khao! Your recipe for nuoc cham looks really good too. I’ve never tried rice wine vinegar in mine.